The boy wakes to darkness on a winter morning in eastern Kansas. He quickly dresses and heads outside, across the farmyard and into the barn, where he grabs a bucket and makes his way to the parlor. He and his brothers hook milking machines to the Holsteins and carry each bucket to the strainer, twice a day, every day. Like countless other kids across the Jayhawk State, Duayne J. Madl earned the title of "farm boy." "We had to work," he said. "My dad had stock cattle and dairy cows, sheep, a few pigs and chickens. When people went to the lake for Memorial Day, we had to put up hay or combine grain." The routine was as much a part of him as his eye color or fingerprints; it's all he'd ever known. The value of work could be measured in the flannel shirt on his back, the watertight roof over his head, the hot breakfast that tasted just a bit better after 90 minutes in the milking parlor. And it could be measured in the .410 single shot the boy carried come bird season. With chores and school done, he gathered up a cattle dog, a pocketful of slender shells and the sort of confidence that comes when you learn to drive a tractor before your seventh birthday. He walked the grassy hedge breaks between harvested fields of corn, sorghum and oats on his father's farm, but he rarely had to walk far. Coveys of bobwhite quail were commonplace. And when the boy fired true, he'd send out his cow-dog-turned-bird-dog to finish the job. Though never formally trained to hunt, any cow dog worth its salt knew what to do when a ball of feathers hit the dust. "She had about a 25-word vocabulary," Madl said of his dog, smiling. "Queenie. When you're on the farm, there's two main names for dogs— Queenie and Rex." Decades have passed since Duayne Madl got up in the dark and milked cows. Now he's a 59-year-old investment adviser who owns his firm and specializes in estate and succession planning. But what his father's dairy farm gave him—a zest for hard work, a passion for bird hunting and an affinity for working canines—have stayed with him, grown stronger and in many ways, become his defining qualities. It's really no wonder the Lake Quivira, Kansas, man sought out Pheasants Forever in the late 1980s or why he got involved with Quail Forever when it was launched in 2005. The habitat organization allows him to focus his talents on the things he cares about most. "Fifty percent of my love of hunting is my dogs," he said. "But it starts with habitat. If you don't have habitat, you don't have birds and you don't have anything to do with your dogs." Madl, already a PF Patron member ($10,000), took his commitment to conservation to a whole other level earlier this year. In June, he finalized the details on a $1 million insurance contract that made Pheasants Forever and QF the beneficiaries. Madl wants the money used to develop habitat for pheasants, quail and other wildlife. 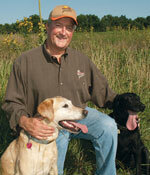 "The people I met with at Pheasants Forever have a true passion for habitat conservation. They have a true passion for it," he said. "You want to give it to an organization that you know is going to be here forever." Back when he was a farm boy growing up near Baldwin City, a small community not far from Lawrence, Madl couldn't have imagined the need for wildlife conservation groups. All he had to do was lace his boots, grab the old break action, whistle up Queenie and go. Around home, his father, Robert, rarely hunted. Helping his wife, JoAnn, raise three boys while managing a farm, dairy and implement dealership left little time for recreation. But the patriarch reserved a weekend each fall to travel west with friends and hunt ring-necked pheasants, a bird that did not occur in eastern Kansas. The young quail hunter had heard of pheasants, but he never saw one until he was old enough to accompany his uncle and cousin on a trip. His family didn't subscribe to Field and Stream magazine and there were no hunting shows on TV, so a ringneck simply had to be experienced first hand. The big, brassy, cackling game bird made an impression that has stayed with him since. "I remember it was a big deal to see pheasants," he said. While a teenager, back closer to home, Madl saw something else that left an impression: a small covey of bobwhite quail frozen under a scraggly cedar tree on a bitterly cold winter morning. "It taught me a lesson," he says. "Quail don't roam for their food. It goes back to habitat." After high school, Madl attended Hutchinson Junior College in south-central Kansas. After classes in the fall, he and friends banked some serious hours toward bachelor's degrees in pheasant hunting. He finished up his schooling at Emporia State University, which was quite a bit closer to home. After college, he took a job selling veterinary pharmaceuticals, which moved him to eastern Iowa and central Nebraska. In 1974, he joined the insurance industry and in 1985, he started his own firm, now located in Shawnee, Kansas. "If it wasn't for my upbringing, I don't think I'd have my own firm," he said. "I was taught a work ethic." The farm boy may be doing something different for a living now, but he lives and works close to the property homesteaded by his great-grandfather. His mother died a few years ago, but his father, now 90, still lives at the home place. His favorite places to take his pointing Labrador retrievers in pursuit of pheasants are in north-central Kansas and north-central South Dakota. A while back, Madl was present in South Dakota while his friend and landowner, David Schaffer, met with a PF farm bill biologist to discuss ways to make habitat improvements through federal conservation programs. Madl was impressed, especially with the one-on-one approach PF was using to help his friend navigate the complexities of the programs. The experience convinced him that working with landowners to help them understand how to farm in a conservation friendly manner was the key to establishing quality wildlife habitat. In fact, in an effort to get farm bill biologists on the ground in his home state, Madl joined the Kansas Grassroots Conservation Camp­aign to raise money for the positions. He currently serves as the eastern Kansas co-chairman of the campaign. When he talks to other PF and QF members, Madl stresses how the organization is well versed in multiple giving methods, such as the insurance contract he used to make his pledge. He's convinced a fit can be found for all hunter-conservationists so they can join the effort to make lasting, landscape-scale changes that will ensure wildlife habitat and the hunting tradition indefinitely. "Some people are reluctant to sit down and seriously consider the subject, putting it off for another time. Really, it just requires thinking about what kind of legacy you want to leave," Madl said. What helped inspire Madl were two other PF members who wanted to leave a conservation legacy, both relatively close to home. The first was Bill Baxter, the late state biologist and farm bill expert from Milligan, Nebraska, who left his 320-acre farm to PF to be used for mentored youth hunts. The second was Wallace Weber, a retired physician from Dorrance, Kansas, who has employed a charitable remainder trust to leave his 1,700-acre farm to PF when he passes on. Along with a passion for conservation, the men shared a long-term vision, said David Bue, vice president of development for PF and QF, who has worked with all three of them on their gifts. "Duayne Madl's commitment to the mission of Pheasants Forever is truly remarkable," Bue said. "As Duayne and I worked together through the donation process, it became clear that leaving a legacy through Pheasants Forever and Quail Forever is extremely important to him. At the same time, he's also serving as a conservation leader in the hope that others will follow." In fact, Madl said the reason he agreed to make the pledge in his name and to tell his story was to spread the word. And just like federal farm programs provide incentives to landowners who employ conservation practices, federal and state tax codes encourage donors to help nonprofit organizations. Donors need to learn about their options.